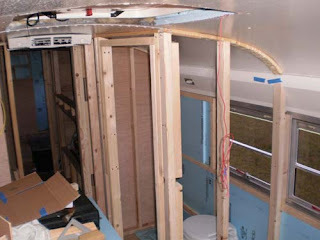 First, here is a pic of the framing completed in the bathroom. Things are getting tight and good pictures are getting harder to take. The first thing we did was cut 2 - 3/4" pieces of oak plywood for our dinette seat backs. Sorry no pics yet. 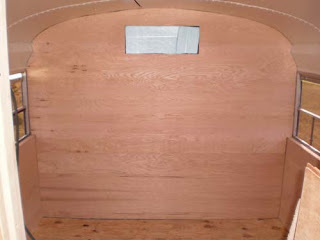 We decided to go ahead and start on the master bedroom but we needed more studs already and more 1/4" oak plywood for paneling the back wall. We went to Lowe's and picked up what we needed. After today I already need another box of 2 1/2" screws. When we got home we started on the master bedroom. 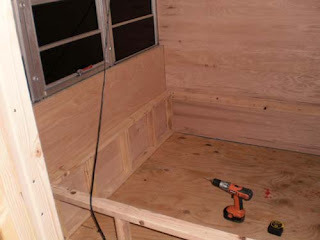 Before we could start on the bed frame we had to insulate and panel the back wall that we had built. 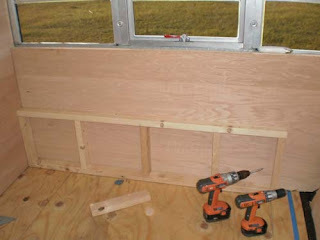 After out blue foam insulation was up we started the more difficult task of figuring out our top panel piece. We wanted it to be a solid piece from left to right. 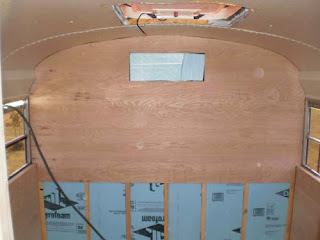 Using our pattern (See day 32) we had to layout exactly where we had to cut out for the arch on the ceiling and where the sides meet into the windows. This was not as easy as it sounds mainly for the reason that if it was going to fit properly both sides had to be cut out almost perfect. 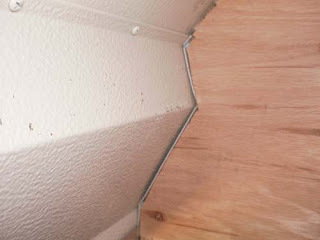 The rectangle in the center will be a shelf of some kind. After installing the top panel the bottom was easy. 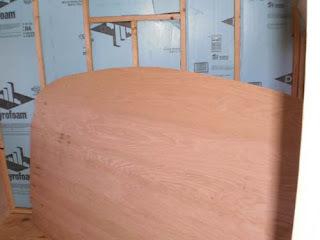 After the panels where installed we started on the bed frame. This is the first part of the frame that is sitting against the drivers side of the bus. We did the same on the passengers side. 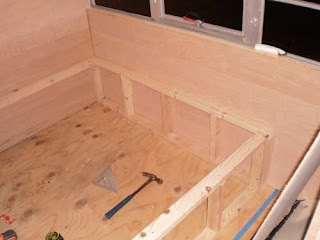 We then built a frame for the front and then ran a stud along the back.